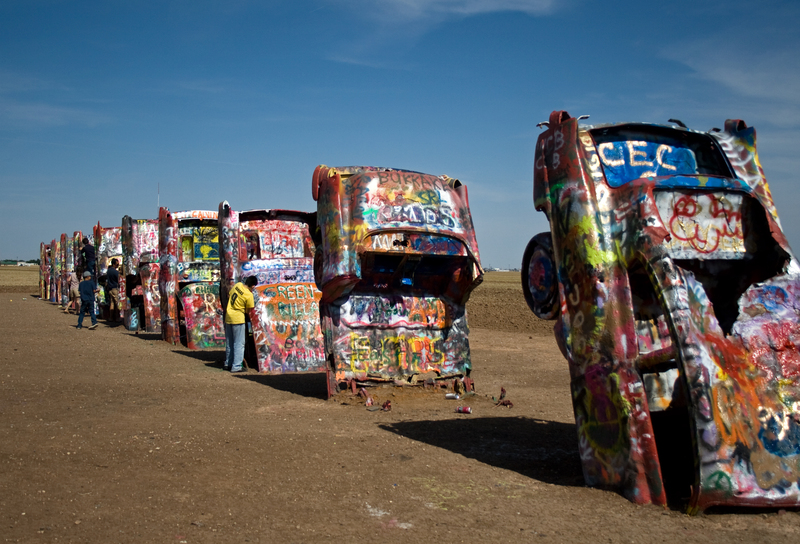 Graffitists leave their mark at the Cadillac Ranch, outside Amarillo, Texas. It stands as a monument to the vehicles and the road that helped shape the United States. It lies just west of Amarillo, Texas, on the old Route 66. Ten big old Cadillacs, planted nose first into the brown Texas dirt, slowly being eaten away by the wind and dust, climbed on and spray-painted over and over again. Names, obscenities, national flags, smiley faces … the place up close smells of aerosol paint and fertiliser. I was keen to see Cadillac Ranch and was keeping a keen eye out for it as I approached Amarillo from the west. I need not have worried. The public art installation, initially set up by an eccentric local millionaire, Stanley Marsh, lies just a couple of hundred metres off the main highway into town. There is a side road where people park and walk across the flat brown land to the cars, to take pictures or leave their mark via spray can. I elected just to take pictures, but had to wait for a while and quickly take shots when the others – mostly teenagers – were out of site behind the cars. Surprisingly, I managed quite a few shots with no one in view. The light was a little harsh when I was there. It was about 4.30pm, on a hot May day. Ideally, I would have timed it to be there during the early evening glow, but that could well have meant still more “spray-ists”. Certainly, there was a steady stream of people coming and going. The Cadillacs make a great photo opportunity. The Cadillacs were originally planted in 1974, but had to be moved further out of town in the late Nineties as Amarillo got bigger. Perhaps, one day, they might be moved again, in which time there may not be much of them left. I liked the place. Sure, it’s a bit kitsch, but there is something about seeing a row of big colourful cars sticking out of brown, flat dirt and under a big blue sky. It certainly provides plenty of photo opportunities … just time your shots so that their are no kids with spray cans ruining the post-apocalyptic feel. You can see more of my Cadillac Ranch photos at my Flickr site here. 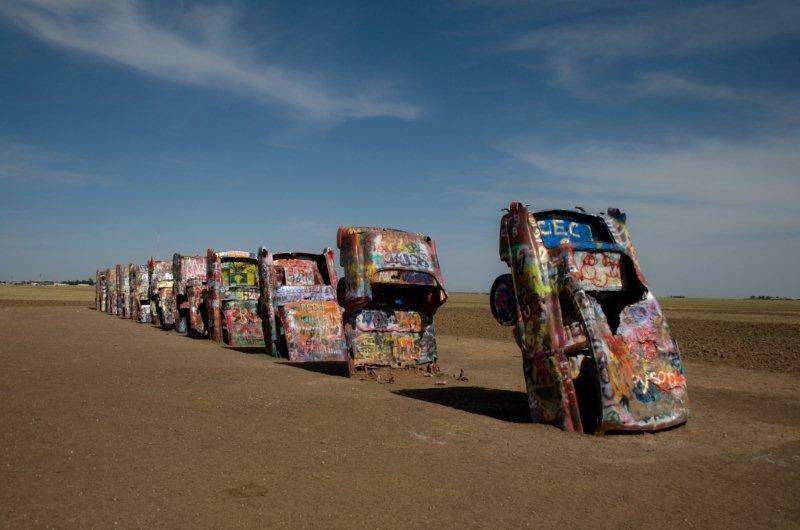 Have you been to Cadillac Ranch? Did you leave your mark, or just photograph it all? Let me know what you think on the place.